Since July 2016 LEWA has been taking over the global sales of centrifugal canned pumps from its Japanese parent company, NIKKISO. From January 2019, their ‘Non-Seal’ brand centrifugal canned motor pumps became available in accordance with DIN EN ISO 2858. Initially, four sizes, the 25-160, 32-125, 40-200 and 50-200, were introduced. 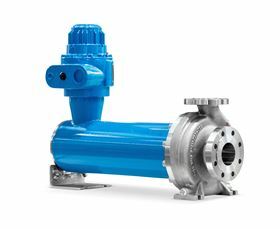 Another four models will follow in February of 2019, while a total of 12 pump sizes will be available by the end of the 3rd quarter of 2019. These centrifugal canned motor pumps are used mainly for the transfer and circulation tasks of easily flammable, explosive or toxic fluids in the chemical and petrochemical industry. They satisfy all the requirements of the ATEX Directive 2014/34/EU and are able to be customized. Models in accordance with the API 685 standard are available. All models are designed without damage-prone mechanical seals, which minimises both immediate as well as long-term hazard risks for employees as well as the environment.